By analysing the specifics of the patient and their disease, molecular diagnostics offers the prospect of personalised medicine. These tests are useful in a range of medical specialisms, including infectious disease, oncology, human leukocyte antigen typing (which investigates and predicts immune function), coagulation, and pharmacogenomics—the genetic prediction of which drugs will work best. (v-vii) They overlap with clinical chemistry (medical tests on bodily fluids). The field of molecular biology grew in the late twentieth century, as did its clinical application. In 1980, Yuet Wai Kan et al. suggested a prenatal genetic test for Thalassemia that did not rely upon DNA sequencing—then in its infancy—but on restriction enzymes that cut DNA where they recognised specific short sequences, creating different lengths of DNA strand depending on which allele (genetic variation) the fetus possessed. In the 1980s, the phrase was used in the names of companies such as Molecular Diagnostics Incorporated and Bethseda Research Laboraties Molecular Diagnostics. During the 1990s, the identification of newly discovered genes and new techniques for DNA sequencing led to the appearance of a distinct field of molecular and genomic laboratory medicine; in 1995, the Association for Molecular Pathology (AMP) was formed to give it structure. In 1999, the AMP co-founded The Journal of Medical Diagnostics. Informa Healthcare launched Expert Reviews in Medical Diagnostics in 2001. From 2002 onwards, the HapMap Project aggregated information on the one-letter genetic differences that recur in the human population—the single nucleotide polymorphisms—and their relationship with disease. (ch 37) In 2012, molecular diagnostic techniques for Thalassemia use genetic hybridization tests to identify the specific single nucleotide polymorphism causing an individual's disease. As the commercial application of molecular diagnostics has become more important, so has the debate about patenting of the genetic discoveries at its heart. In 1998, the European Union's Directive 98/44/ECclarified that patents on DNA sequences were allowable. In 2010 in the US, AMP sued Myriad Genetics to challenge the latter's patents regarding two genes, BRCA1, BRCA2, which are associated with breast cancer. In 2013, the U.S. Supreme Court partially agreed, ruling that a naturally occurring gene sequence could not be patented. The industrialisation of molecular biology assay tools has made it practical to use them in clinics. (foreword) Miniaturisation into a single handheld device can bring medical diagnostics into the clinic and into the office or home. (foreword) The clinical laboratory requires high standards of reliability; diagnostics may require accreditation or fall under medical device regulations. As of 2011, some US clinical laboratories nevertheless used assays sold for "research use only". Laboratory processes need to adhere to regulations, for example Clinical Laboratory Improvement Amendments, Health Insurance Portability and Accountability Act, Good Laboratory Practice, and Food and Drug Administration specifications in the United States. Laboratory Information Management Systems help by tracking these processes. Regulation applies to both staff and supplies. As of 2012, twelve US states require molecular pathologists to be licensed; several boards such as the American Board of Medical Genetics and the American Board of Pathology certify technologists, supervisors, and laboratory directors. Automation and sample barcoding maximise throughput and reduce the possibility of error or contamination during manual handling and results reporting. 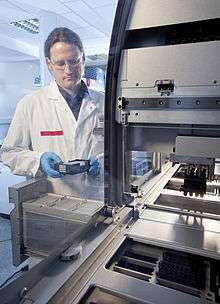 Single devices to do the assay from beginning to end are now available. Because molecular diagnostics methods can detect sensitive markers, these tests are less intrusive than a traditional biopsy. For example, because cell-free nucleic acids exist in human plasma, a simple blood sample can be enough to sample genetic information from tumours, transplants or an unborn fetus. (ch 45) Many, but not all, molecular diagnostics methods based on nucleic acids detection use polymerase chain reaction (PCR) to vastly increase the number of nucleic acid molecules, thereby amplifying the target sequence(s) in the patient sample. 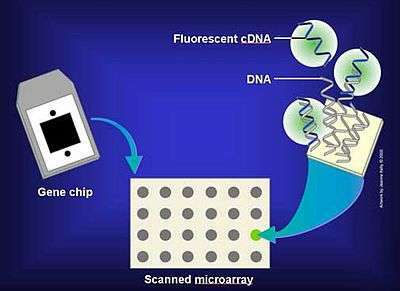 (foreword) The detection of the marker might use real time PCR, direct sequencing,(ch 17) or microarray chips—prefabricated chips that test many markers at once. (ch 24) The same principle applies to the proteome and the genome. High-throughput protein arrays can use complementary DNA or antibodies to bind and hence can detect many different proteins in parallel. 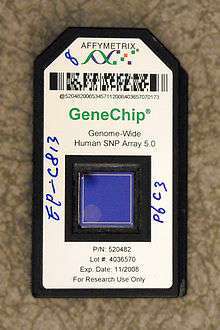 A microarray chip contains complementary DNA (cDNA) to many sequences of interest. The cDNA fluoresces when it hybridises with a matching DNA fragment in the sample. Conventional prenatal tests for chromosomal abnormalities such as Down Syndrome rely on analysing the number and appearance of the chromosomes—the karyotype. Molecular diagnostics tests such as microarray comparative genomic hybridisation test a sample of DNA instead, and because of cell-free DNA in plasma, could be less invasive, but as of 2013 it is still an adjunct to the conventional tests. Some of a patient's single nucleotide polymorphisms—slight differences in their DNA—can help predict how quickly they will metabolise particular drugs; this is called pharmacogenomics. For example, the enzyme CYP2C19 metabolises several drugs, such as the anti-clotting agent Clopidogrel, into their active forms. Some patients possess polymorphisms in specific places on the 2C19 gene that make poor metabolisers of those drugs; physicians can test for these polymorphisms and find out whether the drugs will be fully effective for that patient. Advances in molecular biology have helped show that some syndromes that were previously classed as a single disease are actually multiple subtypes with entirely different causes and treatments. Molecular diagnostics can help diagnose the subtype—for example of infections and cancers—or the genetic analysis of a disease with an inherited component, such as Silver-Russell syndrome. Molecular diagnostics are used to identify infectious diseases such as chlamydia, influenza virus and tuberculosis; or specific strains such as H1N1 virus. Genetic identification can be swift; for example a loop-mediated isothermal amplification test diagnoses the malaria parasite and is rugged enough for developing countries. But despite these advances in genome analysis, in 2013 infections are still more often identified by other means—their proteome, bacteriophage, or chromatographic profile. 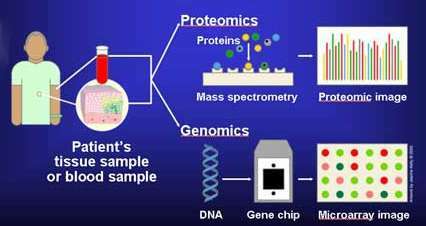 Molecular diagnostics are also used to understand the specific strain of the pathogen—for example by detecting which drug resistance genes it possesses—and hence which therapies to avoid. A patient's genome may include an inherited or random mutation which affects the probability of developing a disease in the future. For example, Lynch syndrome is a genetic disease that predisposes patients to colorectal and other cancers; early detection can lead to close monitoring that improves the patient's chances of a good outcome. Cardiovascular risk is indicated by biological markers and screening can measure the risk that a child will be born with a genetic disease such as Cystic fibrosis. Genetic testing is ethically complex: patients may not want the stress of knowing their risk. In countries without universal healthcare, a known risk may raise insurance premiums. Cancer is a change in the cellular processes that cause a tumour to grow out of control. Cancerous cells sometimes have mutations in oncogenes, such as KRAS and CTNNB1 (β-catenin). Analysing the molecular signature of cancerous cells—the DNA and its levels of expression via messenger RNA—enables physicians to characterise the cancer and to choose the best therapy for their patients. As of 2010, assays that incorporate an array of antibodies against specific protein marker molecules are an emerging technology; there are hopes for these multiplex assays that could measure many markers at once. Other potential future biomarkers include micro RNA molecules, which cancerous cells express more of than healthy ones. 1 2 3 Poste, G. (2001). "Molecular diagnostics: A powerful new component of the healthcare value chain". Expert Review of Molecular Diagnostics. 1 (1): 1–5. doi:10.1586/14737159.1.1.1. PMID 11901792. 1 2 3 4 5 6 7 8 9 Carl A. Burtis; Edward R. Ashwood; David E. Bruns (2012). Tietz Textbook of Clinical Chemistry and Molecular Diagnostics. Elsevier. ISBN 1-4557-5942-2. ↑ Hamburg, M. A.; Collins, F. S. (2010). "The Path to Personalized Medicine". New England Journal of Medicine. 363 (4): 301–304. doi:10.1056/NEJMp1006304. PMID 20551152. ↑ Grody, Wayne W; Nakamura, Robert M; Strom, Charles M; Kiechle, Frederick L. (2010). Molecular Diagnostics: Techniques and Applications for the Clinical Laboratory. Boston MA: Academic Press Inc. ISBN 978-0-12-369428-7. ↑ Kan, Y. W.; Lee, K. Y.; Furbetta, M.; Angius, A.; Cao, A. (1980). "Polymorphism of DNA Sequence in the β-Globin Gene Region". New England Journal of Medicine. 302 (4): 185–188. doi:10.1056/NEJM198001243020401. PMID 6927915. ↑ Cohn, D. V.; Elting, J. J.; Frick, M.; Elde, R. (1984). "Selective Localization of the Parathyroid Secretory Protein-I/Adrenal Medulla Chromogranin a Protein Family in a Wide Variety of Endocrine Cells of the Rat". Endocrinology. 114 (6): 1963–1974. doi:10.1210/endo-114-6-1963. PMID 6233131. ↑ Persselin, J. E.; Stevens, R. H. (1985). "Anti-Fab antibodies in humans. Predominance of minor immunoglobulin G subclasses in rheumatoid arthritis". Journal of Clinical Investigation. 76 (2): 723–730. doi:10.1172/JCI112027. PMC 423887 . PMID 3928684. ↑ Kaplan, G.; Gaudernack, G. (1982). "In vitro differentiation of human monocytes. Differences in monocyte phenotypes induced by cultivation on glass or on collagen". Journal of Experimental Medicine. 156 (4): 1101–1114. doi:10.1084/jem.156.4.1101. PMC 2186821 . PMID 6961188. ↑ Fausto, N.; Kaul, K. L. (1999). "Presenting the Journal of Molecular Diagnostics". The Journal of Molecular Diagnostics. 1: 1. doi:10.1016/S1525-1578(10)60601-0. ↑ Atanasovska, B; Bozhinovski, G; Chakalova, L; Kocheva, S; Karanfilski, O; Plaseska-Karanfiska, D (2012). "Molecular Diagnostics of β-Thalassemia". Balkan Journal of Medical Genetics. 15 (Suppl): 61–5. doi:10.2478/v10034-012-0021-z (inactive 2015-11-18). PMC 3776673 . PMID 24052746. ↑ Sharples, Andrew (2011-03-23). "Gene Patents in Europe Relatively Stable Despite Uncertainty in the U.S.". Genetic Engineering and Biotechnology News. Retrieved 2013-06-13. ↑ Bravin, Jess; Kendall, Brent (13 June 2013). "Justices Strike Down Gene Patents". The Wall Street Journal. Retrieved 15 June 2013. ↑ Robert Barnes; Brady Dennis (13 June 2013). "Supreme Court rules human genes may not be patented". The Washington Post. Retrieved 15 June 2013. 1 2 Gibbs, Jeffrey N (1 August 2008). "Regulatory pathways for molecular diagnosis. Detailing the various options available and what each requires". 24 (14). Genetic Engineering & Biotechnology News. Retrieved 4 September 2013. ↑ Gibbs, Jeffery N (1 April 2011). "Uncertainty persists with RUO products. FDA may be considering more restrictive approach with research use only assays". 31 (7). Genetic Engineering & Biotechnology News. Retrieved 4 September 2013. ↑ Tomiello, Kathryn (21 February 2007). "Regulatory compliance drives LIMS". Design World. Retrieved 7 November 2012. ↑ MacKinnon, A. C.; Wang, Y. L.; Sahota, A.; Yeung, C. C.; Weck, K. E. (2012). "Certification in Molecular Pathology in the United States". The Journal of Molecular Diagnostics. 14 (6): 541–549. doi:10.1016/j.jmoldx.2012.05.004. PMID 22925695. ↑ Molecular Diagnostics: Current Technology and Applications (Horizon Bioscience). 7 July 2006. p. 97. ISBN 1-904933-19-X. ↑ Van Ommen, G. J. B.; Breuning, M. H.; Raap, A. K. (1995). "FISH in genome research and molecular diagnostics". Current Opinion in Genetics & Development. 5 (3): 304–308. doi:10.1016/0959-437X(95)80043-3. ↑ Hammerling, J. A. (2012). "A Review of Medical Errors in Laboratory Diagnostics and Where We Are Today". Laboratory Medicine. 43 (2): 41–44. doi:10.1309/LM6ER9WJR1IHQAUY. ↑ Walter, Gerald; Büssow, Konrad; Lueking, Angelika; Glökler, Jörn (2002). "High-throughput protein arrays: prospects for molecular diagnostics". Trends in Molecular Medicine. 8 (6): 250–253. doi:10.1016/S1471-4914(02)02352-3. PMID 12067604. ↑ "Advances in Prenatal Molecular Diagnostics Conference (Introduction)". HealthTech. 2013. Retrieved 2013-09-28. 1 2 3 4 "Molecular Diagnostics - National Cancer Institute". Cancer.gov. 2005-01-28. Retrieved 2013-09-26. ↑ Desta, Z.; Zhao, X.; Shin, J. G.; Flockhart, D. A. (2002). "Clinical Significance of the Cytochrome P450 2C19 Genetic Polymorphism". Clinical Pharmacokinetics. 41 (12): 913–958. doi:10.2165/00003088-200241120-00002. PMID 12222994. ↑ Eggermann, T.; Spengler, S.; Gogiel, M.; Begemann, M.; Elbracht, M. (2012). "Epigenetic and genetic diagnosis of Silver–Russell syndrome". Expert Review of Molecular Diagnostics. 12 (5): 459–471. doi:10.1586/erm.12.43. PMID 22702363. ↑ Tong, C. W.; Mallinson, H. (2002). "Moving to nucleic acid-based detection of genital Chlamydia trachomatis". Expert Review of Molecular Diagnostics. 2 (3): 257–266. doi:10.1586/14737159.2.3.257. PMID 12050864. ↑ Deyde, V. M.; Sampath, R.; Gubareva, L. V. (2011). "RT-PCR/electrospray ionization mass spectrometry approach in detection and characterization of influenza viruses". Expert Review of Molecular Diagnostics. 11 (1): 41–52. doi:10.1586/erm.10.107. PMID 21171920. ↑ Pai, M.; Kalantri, S.; Dheda, K. (2006). "New tools and emerging technologies for the diagnosis of tuberculosis: Part I. Latent tuberculosis". Expert Review of Molecular Diagnostics. 6 (3): 413–422. doi:10.1586/14737159.6.3.413. PMID 16706743. ↑ Burkardt, H. J. (2011). "Pandemic H1N1 2009 ('swine flu'): Diagnostic and other challenges". Expert Review of Molecular Diagnostics. 11 (1): 35–40. doi:10.1586/erm.10.102. PMID 21171919. ↑ Han, E. T. (2013). "Loop-mediated isothermal amplification test for the molecular diagnosis of malaria". Expert Review of Molecular Diagnostics. 13 (2): 205–218. doi:10.1586/erm.12.144. PMID 23477559. 1 2 Tang, Yi-Wei; Procop, Gary W.; Persinga, David H. (1997-11-01). "Molecular diagnostics of infectious diseases". Clinical Chemistry. American Association for Clinical Chemistry. 43 (11): 2021–2038. PMID 9365385. ↑ Van Lier, M. G. F.; Wagner, A.; Van Leerdam, M. E.; Biermann, K.; Kuipers, E. J.; Steyerberg, E. W.; Dubbink, H. J.; Dinjens, W. N. M. (2010). "A review on the molecular diagnostics of Lynch syndrome: A central role for the pathology laboratory". Journal of Cellular and Molecular Medicine. 14 (1–2): 181–197. doi:10.1111/j.1582-4934.2009.00977.x. PMID 19929944. ↑ Shrimpton, A. E. (2002). "Molecular diagnosis of cystic fibrosis". Expert Review of Molecular Diagnostics. 2 (3): 240–256. doi:10.1586/14737159.2.3.240. PMID 12050863. ↑ Andorno, R. (2004). "The right not to know: An autonomy based approach". Journal of Medical Ethics. 30 (5): 435–439; discussion 439–40. doi:10.1136/jme.2002.001578. PMC 1733927 . PMID 15467071. ↑ Minamoto, T.; Ougolkov, A. V.; Mai, M. (2002). "Detection of oncogenes in the diagnosis of cancers with active oncogenic signaling". Expert Review of Molecular Diagnostics. 2 (6): 565–575. doi:10.1586/14737159.2.6.565. PMID 12465453. ↑ Brennan, D. J.; O'Connor, D. P.; Rexhepaj, E.; Ponten, F.; Gallagher, W. M. (2010). "Antibody-based proteomics: Fast-tracking molecular diagnostics in oncology". Nature Reviews Cancer. 10 (9): 605–617. doi:10.1038/nrc2902. PMID 20720569. ↑ Ferracin, M.; Veronese, A.; Negrini, M. (2010). "Micromarkers: MiRNAs in cancer diagnosis and prognosis". Expert Review of Molecular Diagnostics. 10 (3): 297–308. doi:10.1586/erm.10.11. PMID 20370587.